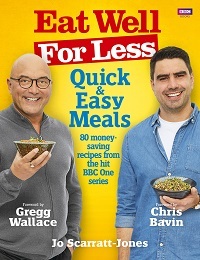 Food doesn’t have to cost the earth, as the 5 million people who watch TV show Eat Well for Less will tell you. We just love this new Thai Beef salad recipe. The tastiest salad you’ll ever eat, a Thai beef salad is a thing of beauty, too. It’s spicy, hot, crunchy and cool, with perfectly cooked slices of steak running through it. 1 Heat a griddle pan until hot. Rub the rapeseed oil over the steaks, then place them in the hot griddle pan and cook over a high heat for 2 minutes on each side until browned – as the steaks cook, you will see them cooking from the side and the colour will change along the edge of each steak as it cooks through. You want it to have changed colour about halfway up before turning it over. Transfer the cooked steaks to a plate. 2 Whisk the lime zest and juice, soy sauce, sugar, fish sauce and garlic together in a small bowl. Pour over the hot steaks and leave to rest/marinate for about 5 minutes, while you prepare the remaining ingredients. Once prepped, tip all the remaining salad ingredients into a salad bowl. 3 Slice the steaks and add to the salad bowl, drizzling any marinade over the top, then toss the whole lot together. 4 Divide the beef salad among three plates and sprinkle over the crushed peanuts and sliced chillies (for those that like it hot!) to finish.